"Fiddlefire!" 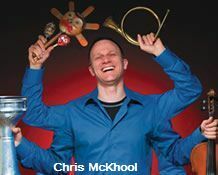 was the encore number in this 80-minute Kids Concert by the VSO that accompanied Chris McKhool and his musical friends from Sultans of String. This is also the title of his latest CD album which was nominated for the JUNO Awards. McKhool got kids and families clapping, dancing and singing songs during his performanc with his ensemble of two guitarists and one percussion instrumentalist. But what skills! They could play anything from Flamenco, Salsa and Bossa Nova to Funk and Rock 'n Roll! But as his name implies, he was cool. He himself played mandolin and fiddle. This was also an educational experience as Maestro John Morris Russell explained to the kids the different string, wind and percussion instruments. Right before the performance, kids lined up to try out the different instruments in the second floor of the Orpheum. During the show, VSO and McKhool got the kids, parents and grandparents singing and clapping with him. In one number, he got us to get our car keys and accompany him with infectious songs that got us singing and swaying. 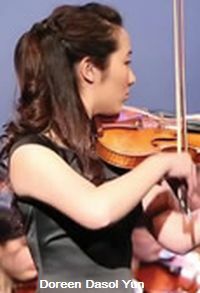 Guest violinist Doreen Dasol Yun appeared at the start of the programme and played Sarasate's Zigeunerweisen,Op. 20, a gypsy-inspired composition. She's a 17 year- old high school student from Vancouver, and has won numerous prizes and awards and has performed in Canada, USA, Russia, Austria, Italy and Korea.